Citing new Enterprise Rent-A-Car data, I-CAR announced that customers of the country’s top 100 Gold Class shops only had to rent vehicles for an average of 6.5 days while their own cars were being fixed — nearly half the time of the national average. Enterprise reported Friday that national average rental time related to vehicle repair was 11.5 days in January-March, about a tenth of a day less than the first quarter of 2014. I-CAR’s top 100 shops saw customers returning their keys to one of Enterprise’s more than 5,500 locations in 6.5 days. The top 500 Gold Class shops cut the loan duration down to 7.9 days in the first quarter, and I-CAR Gold Class shops on average knocked more than a day off the rental time to 10.2 days. If you needed a “What’s in it for me?” reason to train your staff, there it is, according to I-CAR CEO John Van Alstyne, who in April lamented the lack of continuing education industrywide. 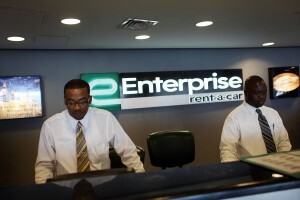 Enterprise attributed the overall 2.4-hour reduction in average rental time to factors including better weather in the Midwest and the vehicles and procedures involved in the repair. We’ve reached out to Enterprise for elaboration on the impact repair methodology and vehicle changes have on cycle times. Check Repairer Driven News for updates. European cars took the longest to repair on average, Enterprise data indicated, with customers renting from the Enterprise fleet for 12.45 days compared to 10.89 for everything else manufactured abroad and 11.03 days for American cars. Data for cars in January-March 2014 were not immediately available.